Harley is a hip, young scientist who happens to have an IQ the size of Mt. Rushmore. While experimenting with a shrinking machine, something goes terribly wrong--the machine explodes and Harley is now the size of a bug! Harley has to find the missing pieces of his machine and reassemble it in order to return to his regular size. 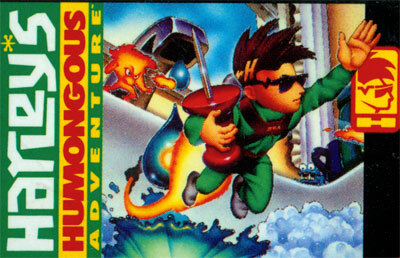 You'll guide him through all kinds of crazy capers, commandeering a tank, parachuting, using a jet pack, and fighting a giant rat, that will lead him to the parts he needs. When you're the size of an insect everything looks humongous, but even normal-sized people will agree that Harley's adventure is humongous.